Set against a black background, Tsuri pine trees reflect subtle blues and greens with gold accents. The crane is beautifully detailed in shades of white and gold. Made in Japan of 100% shrink resistant cotton, this women's yukata features traditional butterfly sleeves. This yukata is perfect for use as loungewear, a robe or as a cover-up at the beach or pool. A matching belt is included. Easy to care for, this robe is machine washable, cold water for best results. 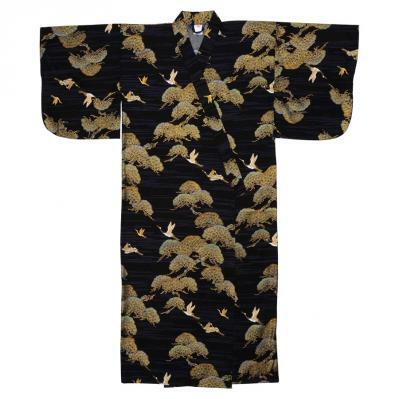 This yukata is available in three sizes: Medium, Medium/Wide and Large. Medium/Wide, measures 56" in length with a wider and roomier fit. This yukata is designed to fit a woman 5' 2" to 5' 7" in height. The sleeve length is 15", the shoulder width is 31" and the girth is 54". Large, measures 58" in length, and is designed to fit a woman 5' 7" to 5' 10" in height. The sleeve length is 13", the shoulder width is 24" and the girth is 45". If you are seeking a shorter length robe, see our Happi Coats which are a shorter length versions of the yukata and kimono.